Miss Rosalind Lacey has spent all her 26 years in the country, quietly managing the lives of her widowed father and five younger siblings. When she learns she has contracted the illness that killed her mother, she decides to spend her last few months doing all the things she’s never had the time or opportunity to experience. The simple country miss is transformed into a dashing Town sophisticate as she cuts a wide and wild swath through London Society, with help from her notorious aunt and the rakish Max Davenant. The plot for Miss Lacey’s Last Fling was inspired by an old TV series. Learn which series it was, as well as how Candice decided on the nature of Rosie’s illness. Romance Reviews Today gives Miss Lacey's Last Fling a "Perfect 10" rating. Their review says: "A gem! May well be the best Regency romance of the year." The Romance Reader says: "Candice Hern never fails to deliver a well written Regency with quirky, fun characters and a romance that feels genuine to the core." Heart Rate Reviews says: "Thoroughly entertaining. the story wraps around you from the beginning and totally pulls you into its heart." Romantic Times Bookclub awards Miss Lacey's Last Fling 4 stars. Their reviews says: "Ms. Hern pens both believable and likeable characters, while writing with a wit and style that easily reflects the period itself. " Miss Lacey's Last Fling hit #1 on the Amazon Top 100 historical romances list (books and print books). 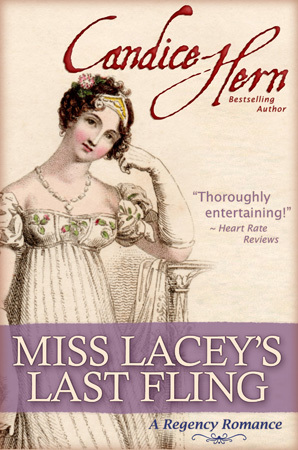 Miss Lacey's Last Fling hit #1 on the Apple iBooks Historical Romance list. Miss Lacey's Last Fling WINS the Booksellers' Best Award, judged by booksellers across the country. Miss Lacey's Last Fling WINS the Award of Excellence, sponsored by Colorado Romance Writers. Miss Lacey's Last Fling WINS the 2001 Dorothy Parker Reviewers Choice Award from RIO (Reviewers International Organization). Miss Lacey's Last Fling is a finalist for the National Readers Choice Award. With the merest pressure at her waist, he led her into the dance. It was easy to follow the rhythm of the music as well as Max’s gentle yet persuasive lead. In less than a moment, Rosie found herself twirling and spinning in perfect accord with the music. It was pure heaven. Max had her completely in his control. She kept her eyes on his, and everything else seemed to fade away. There was only Max, with his intense brown eyes and soft smile, the hand at her waist pressing ever so gently it might have been a caress. She closed her eyes, drinking in the scent of him – bay rum, brandy, the starch of his neckcloth – and let the music, and Max, guide her steps. For this moment alone, the trip to London had been worthwhile. “Your aunt mentioned it. Fanny believes it only includes such innocuous entries as visiting the Tower or Westminster Abbey. But I suspect there are other sorts of activities on that list.” A slow, lazy grin split his face, and he winked at her. Rosie threw back her head and laughed. “And what of it?” she asked. “Rogue! I shall always be the country mouse to you. But if you must know, by the end of this evening, I believe I shall have checked off several items on my list.” For one thing, she was determined to be thoroughly kissed. Rosie did not believe Max would accommodate her there. He did not think of her in that way. She was no more than an amusing rustic, a mere diversion. Max was used to glamorous high flyers and only flirted with her out of mischief, or out of habit, or possibly because Fanny asked him to do so. In any case, it meant nothing. Rosie was quite certain, however, she could entice one of the other gentlemen into kissing her. Lord Radcliffe, perhaps? “Oh, my.” The room had suddenly grown quite warm.